Teens 12 and older are invited to join the library for a Gaming Club. The library will provide cards, board games, and have the Wii hooked up, so you can sit back, relax, and play. 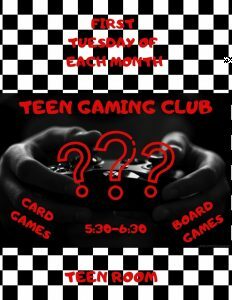 The Teen Game Club will be held every first Tuesday of the month from 5:30 PM until 6:30 PM. No registration is required.